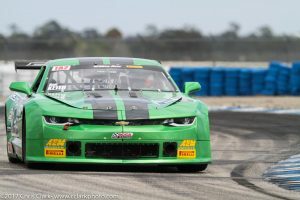 Beautiful Florida sunshine was the standard for the season opener of the SCCA Trans-Am series at Sebring International. BC Race Cars fielded 2 TA2 and 1 TA car, entering the weekend with anticipation of large car counts and great racing on the new series regulated Pirelli tires. Kevin Poitras started out with a bang, setting fastest time in first practise. Obviously our set-up suited the new radials better or we just made a better guess. Thru-out practise, Kevin was always in the top ten, even after a crash in T17 which the remarkable BCR crew repaired overnight. Qualifying saw some blistering lap times as the other teams had figured out the set up, but our #73 still placed 11th with a sub-2:10 lap time. Ron Keith was steadily coming up to speed thru-out the practise sessions, not having driven a race car for 8 months. By qualifying, the BCR crew managed to adjust the car to his liking and Ron pulled off a 12th, right behind his team-mate, out of this ultra-competitive 28 car field. Not having done any long runs on the Pirelli tires, we anticipated having to save the rears thru the race distance. As it turned out, a massive wreck caused a 25 minute red flag condition and our “saving tire” strategy back fired. With only 4 laps of green, both cars were running around where they qualified, eventually finishing 10th for Ron and 15th for Kevin after a penalty that pushed him out of the top 10. Blaise Csida struggled to come up to speed, new car and not having driven for 3 years. The TA cars had very little practise, marred by red flags and 2 lap runs. In qualifying, the #15 layed down a 10th place lap early on, but was unable to improve with traffic and yet another red flag. Disappointed, as even with the 100 lbs penalty, the car was significantly faster than the driver…. The disappointment continued in the race as the hood popped up at the start, blocking visibility. Blaise puttered back to pit lane where the crew promptly fixed the problem, and drove an uneventful race eventually finishing 10th one lap down. All the BCR cars ran flawlessly all weekend, a testament to the preparation of the crew. 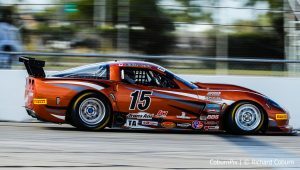 Both the #15 TA car and #25 TA2 Camaro are available to qualified drivers for the next Trans-Am events, please contact Blaise for details.